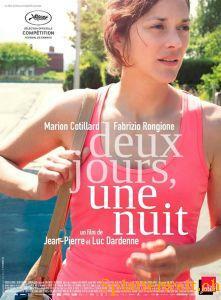 Marion Cotillard’s methodical performance as a woman battling depression is beautiful. She deftly captures the despair and isolation that people with depression feel. Even her brief moments of happiness were encumbered by melancholy. Absolutely beautiful performance, well-deserving of an Oscar nomination. I will not be including this in the score, as I do not speak French, and I won’t go off of the subtitles, because some things (ie, the beauty of the dialogue) get lost in translation. I am putting it on the list here so no one thinks I forgot about it. There were quite a few women in this film as well several POC’s. It’s nice to see that at least European filmmakers aren’t as whitewashed as American ones. There are several scenes where Sandra is shown walking alone. These cuts are several seconds long, and at first I thought it wasn’t necessary for them to be so long. But as the film progressed I realised that they were purposefully filmed so as to metaphorically express the burdening isolation she felt. It is really quite brilliant. There really wasn’t a lot of music in this film. But if there was one flaw with it, I would say that the outdoor scenes could have been edited a little more crisply. A story about a woman about to return back to work after being on sick leave due to depression. However, the Friday before she is due to return, she is informed by a coworker that the staff was given a vote to either keep her employed or to receive a €1,000 bonus. All but two of the staff opt for the bonus. Sandra then spends the weekend trying to convince her coworkers that she is able to work, all while trying to suppress a fresh wave of depression that has just washed over her in light of the news. It is a sagacious look at not only the effects of crippling mental illness but also at the rapacious habit and dog-eat-dog philosophy of human nature. A modest but powerful little film.